1. 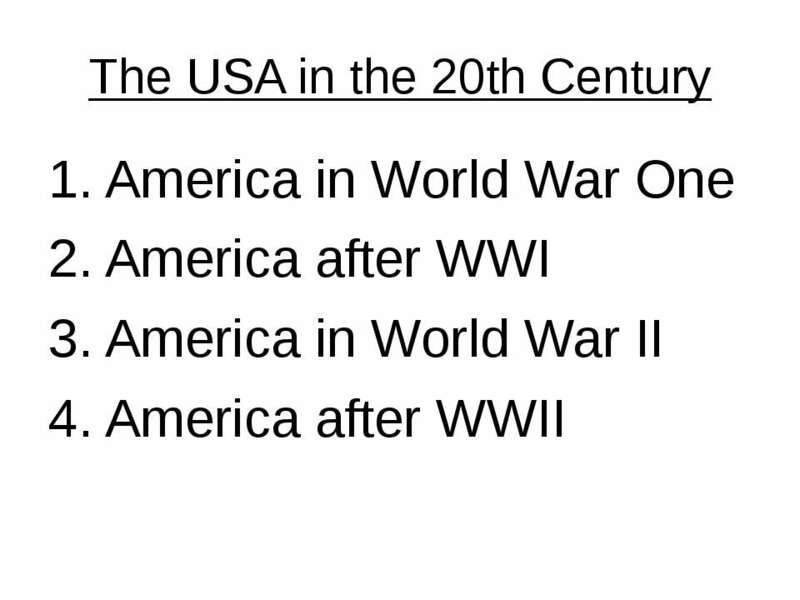 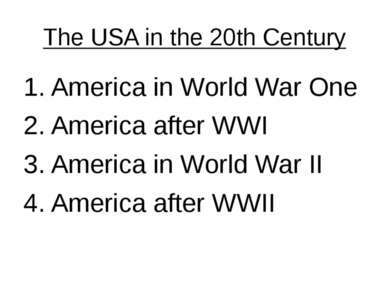 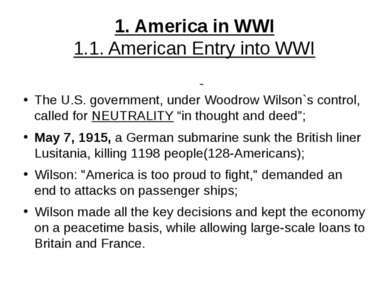 America in WWI 1.1. 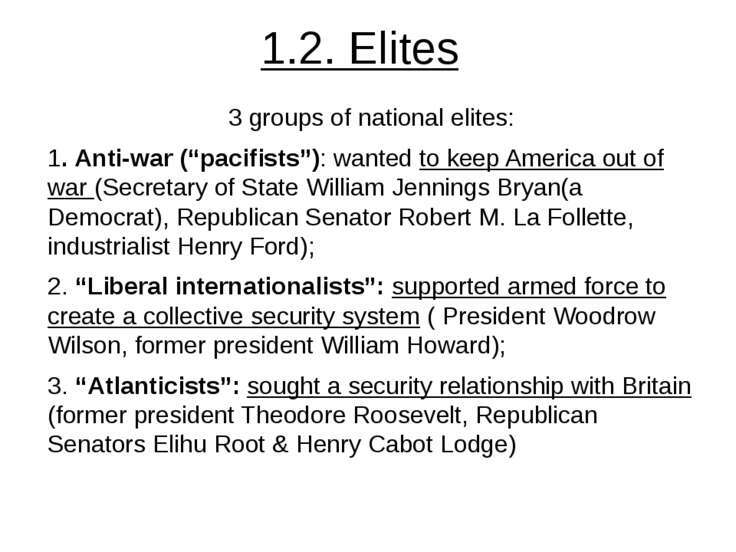 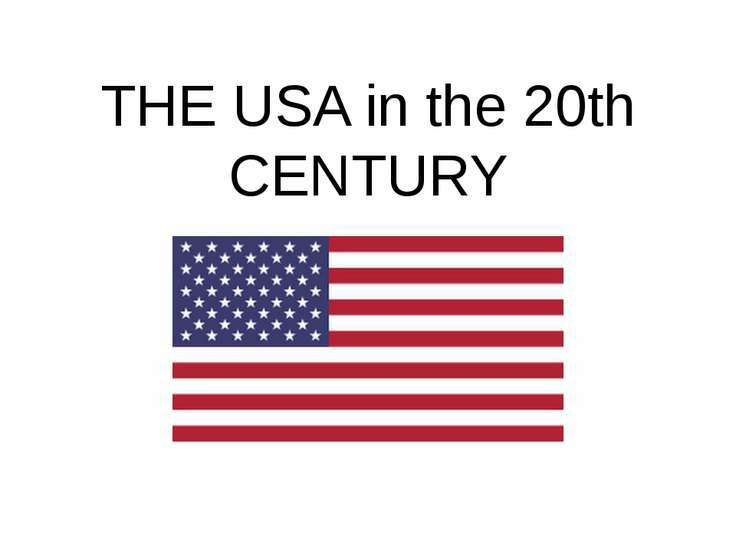 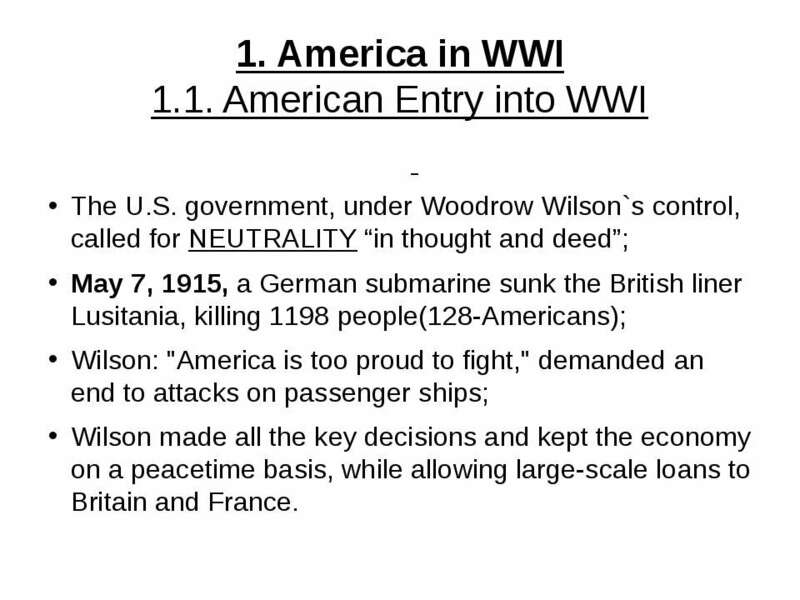 American Entry into WWI The U.S. government, under Woodrow Wilson`s control, called for NEUTRALITY “in thought and deed”; May 7, 1915, a German submarine sunk the British liner Lusitania, killing 1198 people(128-Americans); Wilson: "America is too proud to fight," demanded an end to attacks on passenger ships; Wilson made all the key decisions and kept the economy on a peacetime basis, while allowing large-scale loans to Britain and France. 1.3. Business considerations The beginning of World War I in Europe coincided with the end of the Recession of 1913-1914 in America. 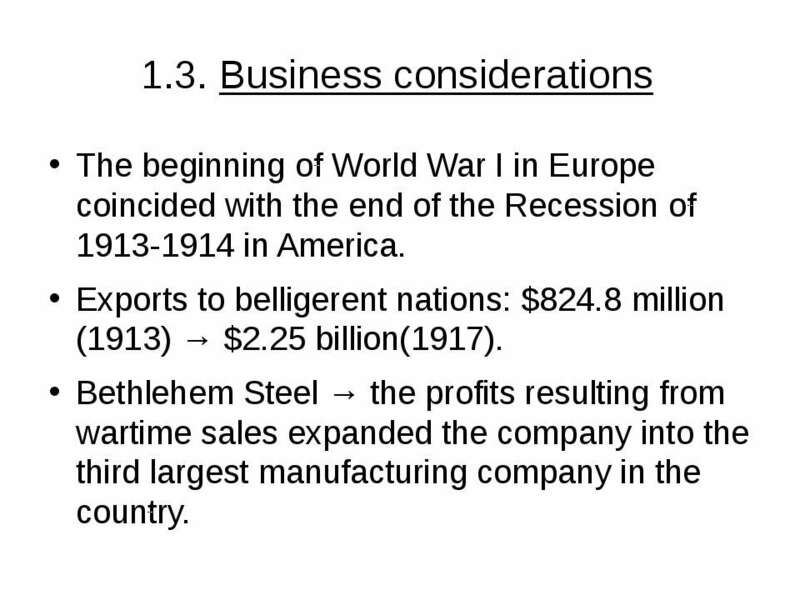 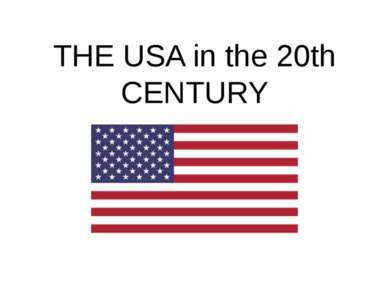 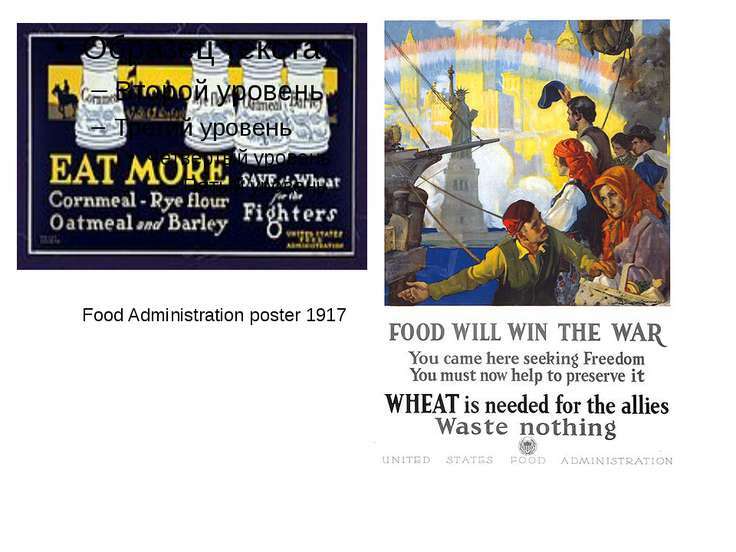 Exports to belligerent nations: $824.8 million (1913) → $2.25 billion(1917). 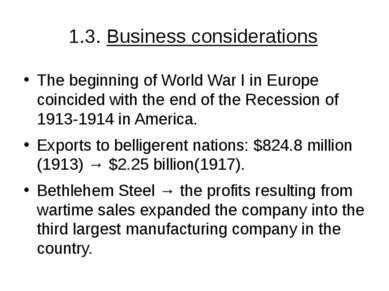 Bethlehem Steel → the profits resulting from wartime sales expanded the company into the third largest manufacturing company in the country. 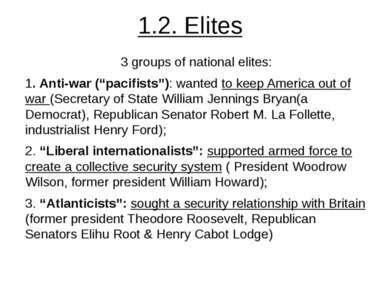 1.4. 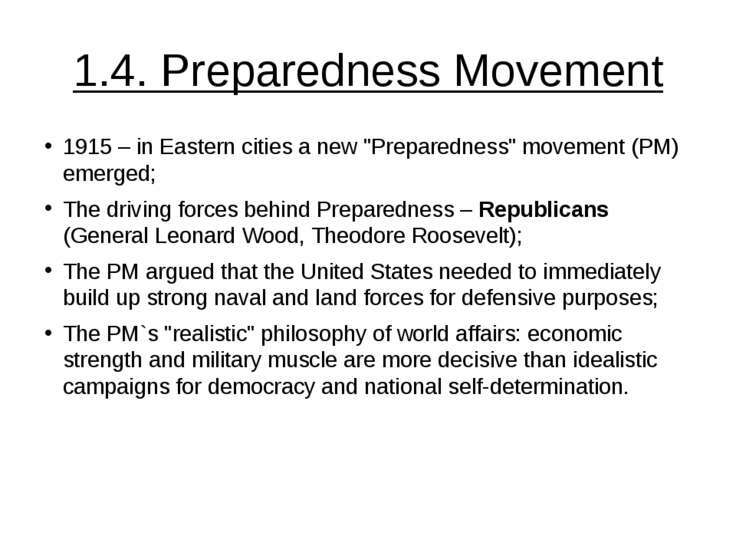 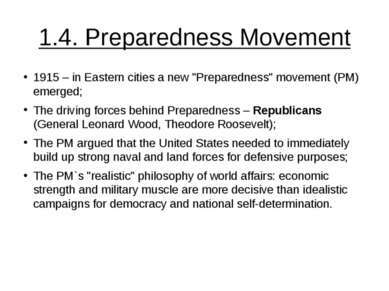 Preparedness Movement 1915 – in Eastern cities a new "Preparedness" movement (PM) emerged; The driving forces behind Preparedness – Republicans (General Leonard Wood, Theodore Roosevelt); The PM argued that the United States needed to immediately build up strong naval and land forces for defensive purposes; The PM`s "realistic" philosophy of world affairs: economic strength and military muscle are more decisive than idealistic campaigns for democracy and national self-determination. 1.5. 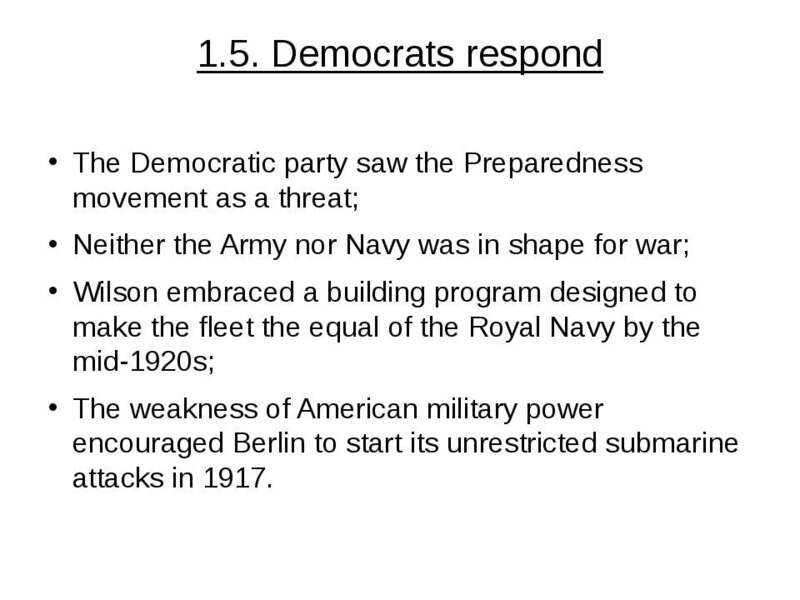 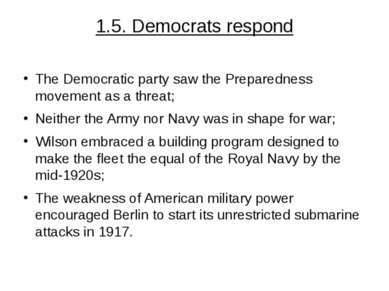 Democrats respond The Democratic party saw the Preparedness movement as a threat; Neither the Army nor Navy was in shape for war; Wilson embraced a building program designed to make the fleet the equal of the Royal Navy by the mid-1920s; The weakness of American military power encouraged Berlin to start its unrestricted submarine attacks in 1917. 1.6. 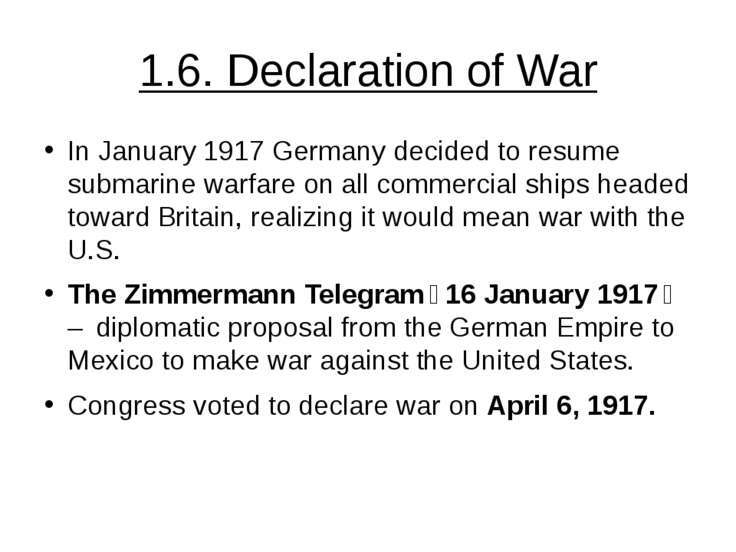 Declaration of War In January 1917 Germany decided to resume submarine warfare on all commercial ships headed toward Britain, realizing it would mean war with the U.S. 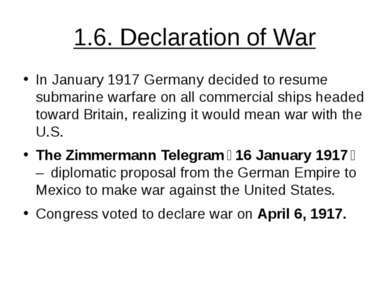 The Zimmermann Telegram（16 January 1917） – diplomatic proposal from the German Empire to Mexico to make war against the United States. 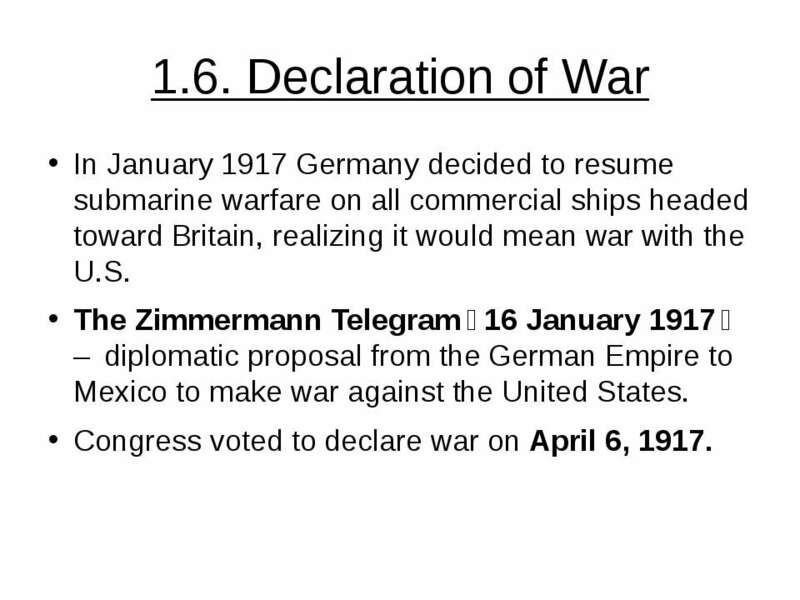 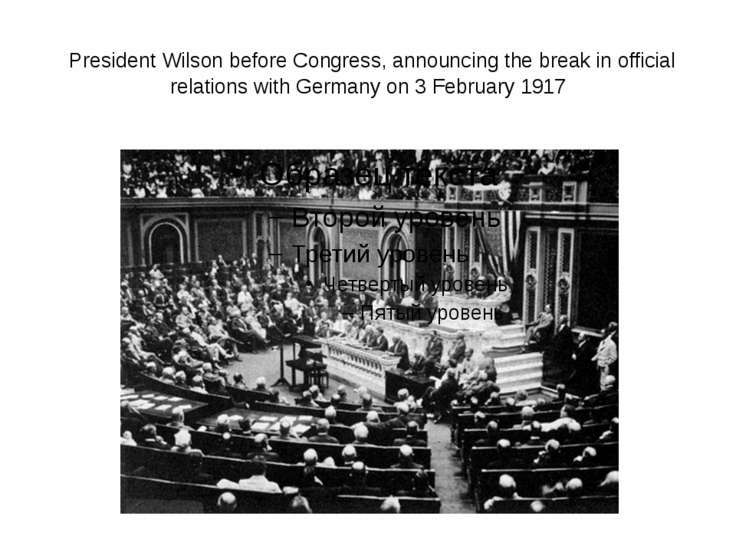 Congress voted to declare war on April 6, 1917. 1.7. 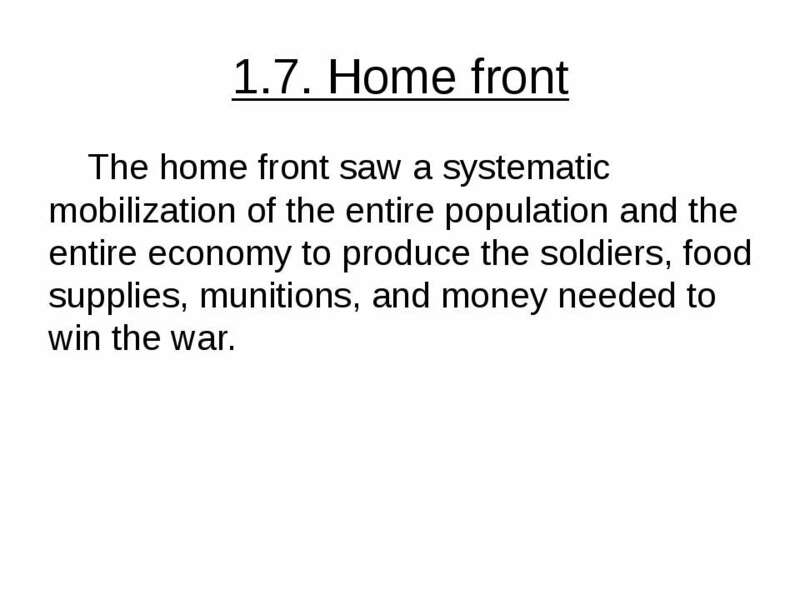 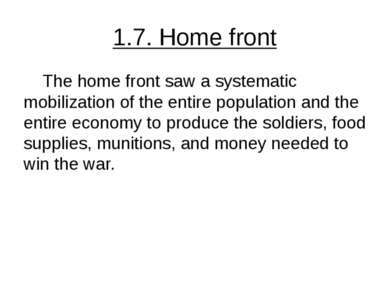 Home front The home front saw a systematic mobilization of the entire population and the entire economy to produce the soldiers, food supplies, munitions, and money needed to win the war. 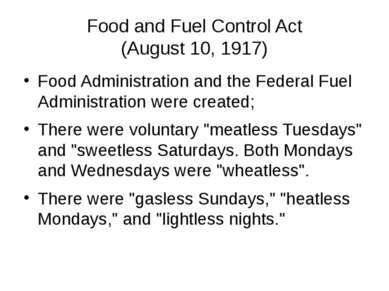 Food and Fuel Control Act (August 10, 1917) Food Administration and the Federal Fuel Administration were created; There were voluntary "meatless Tuesdays" and "sweetless Saturdays. Both Mondays and Wednesdays were "wheatless". 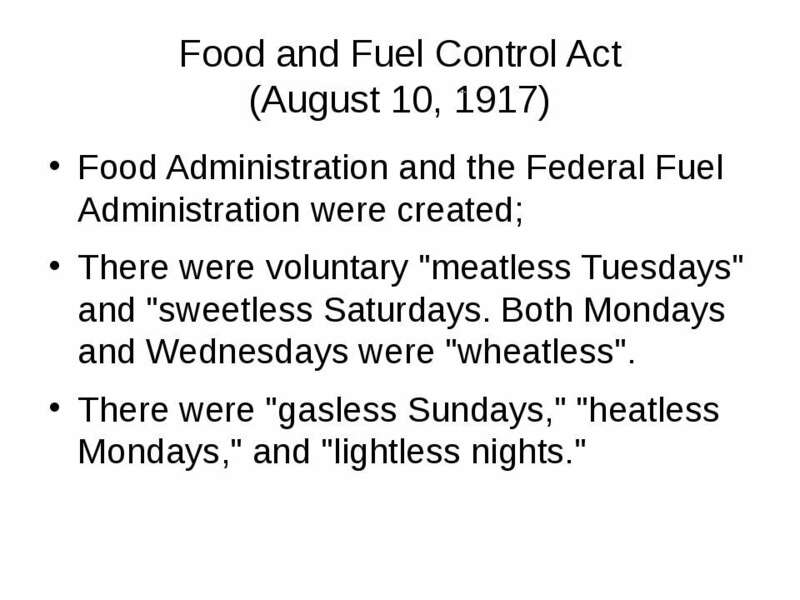 There were "gasless Sundays," "heatless Mondays," and "lightless nights." Children Girls too young for paid jobs learned how they could help the war effort. 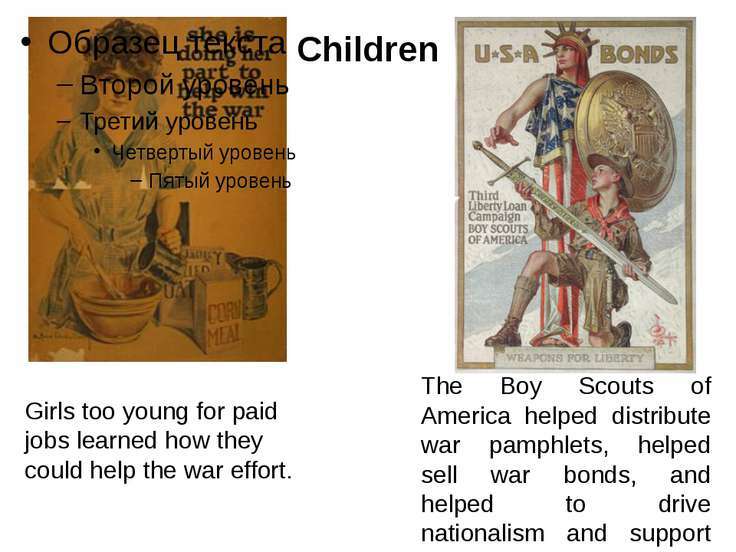 The Boy Scouts of America helped distribute war pamphlets, helped sell war bonds, and helped to drive nationalism and support for the war. 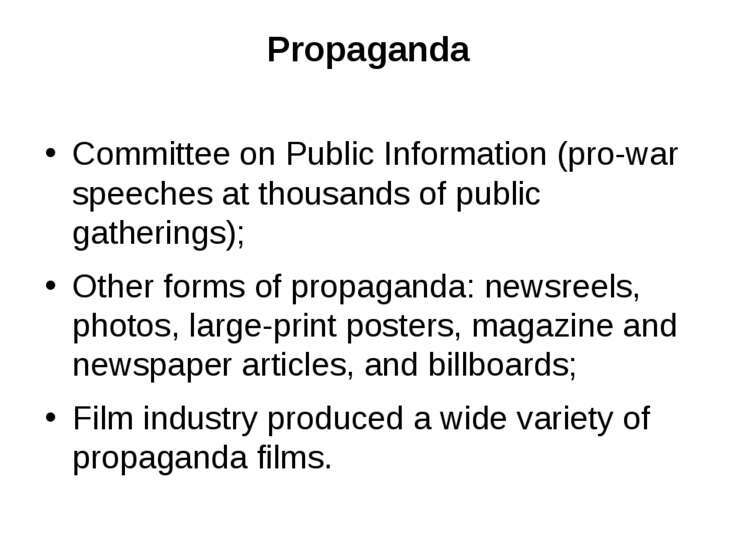 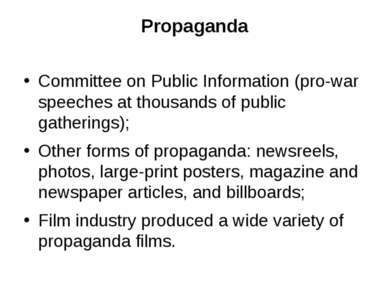 Propaganda Committee on Public Information (pro-war speeches at thousands of public gatherings); Other forms of propaganda: newsreels, photos, large-print posters, magazine and newspaper articles, and billboards; Film industry produced a wide variety of propaganda films. 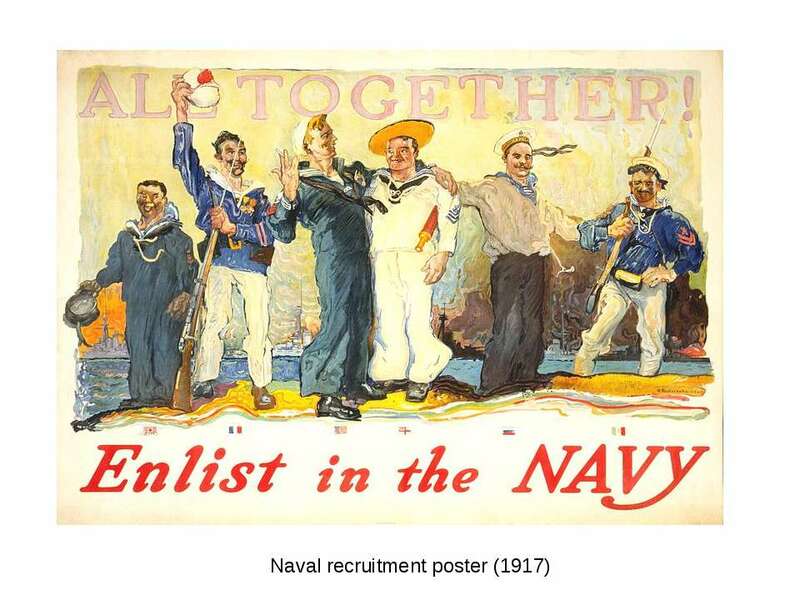 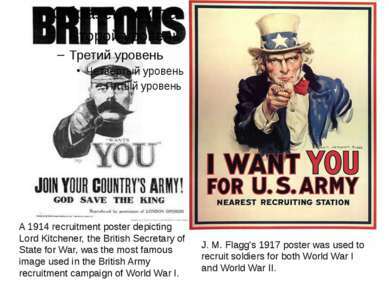 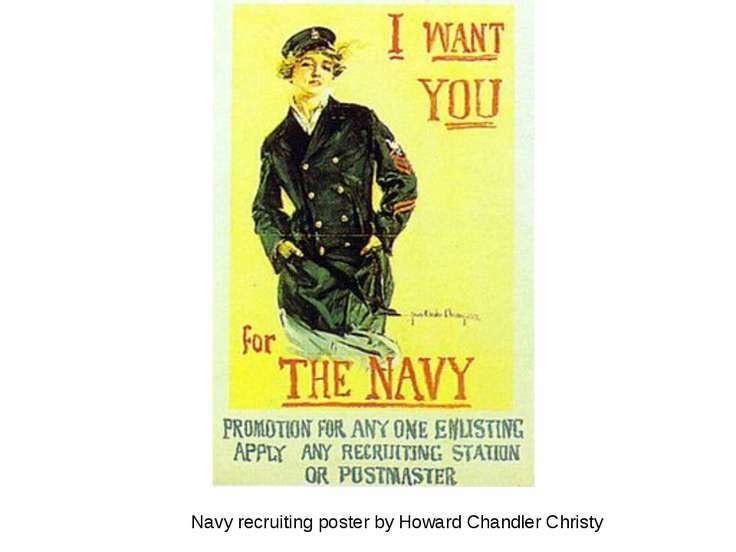 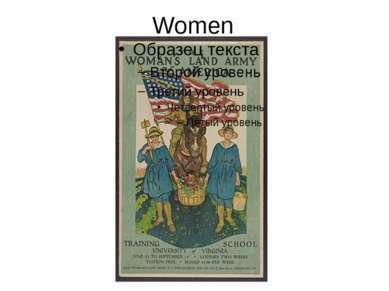 J. M. Flagg's 1917 poster was used to recruit soldiers for both World War I and World War II. A 1914 recruitment poster depicting Lord Kitchener, the British Secretary of State for War, was the most famous image used in the British Army recruitment campaign of World War I. 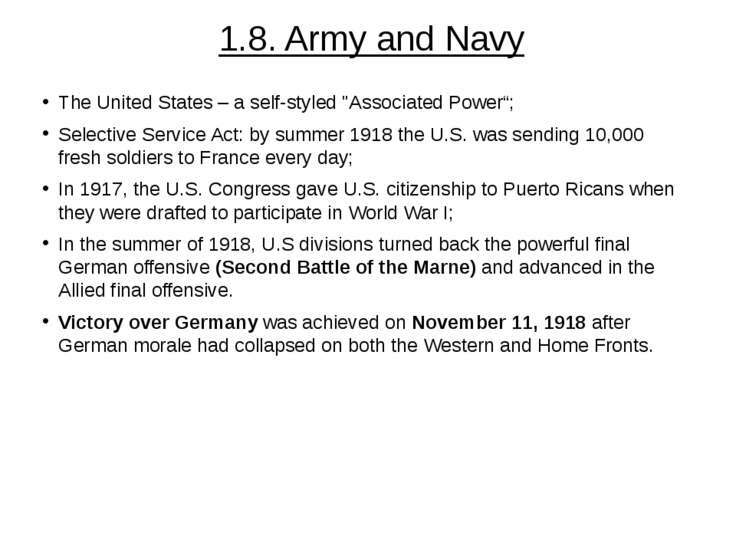 1.8. 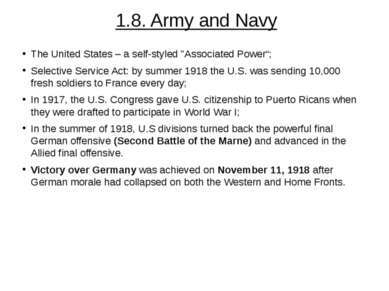 Army and Navy The United States – a self-styled "Associated Power“; Selective Service Act: by summer 1918 the U.S. was sending 10,000 fresh soldiers to France every day; In 1917, the U.S. Congress gave U.S. citizenship to Puerto Ricans when they were drafted to participate in World War I; In the summer of 1918, U.S divisions turned back the powerful final German offensive (Second Battle of the Marne) and advanced in the Allied final offensive. Victory over Germany was achieved on November 11, 1918 after German morale had collapsed on both the Western and Home Fronts.